Clarets striker Sam Vokes insists he didn’t suffer any repercussions after going down awkwardly in the Lancashire derby defeat to Preston North End. 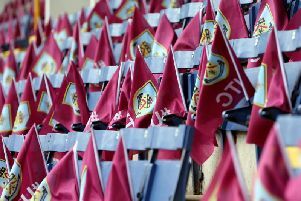 The 26-year-old clutched his knee following the challenge from Lilywhites skipper Tom Clarke which led to Will Keane scoring the opening goal just after the hour mark at Turf Moor. The Welshman was the first of five players at the club to sustain a cruciate knee ligament injury in a fixture against Leicester City towards the end of the promotion campaign. Vokes, who netted 21 times that term, was sidelined for nine months due to the injury before he made his first team return against Liverpool in the Premier League on Boxing Day last year. “Luckily I got up and jogged it off and it felt really strong,” he said. “I kind of know the symptoms that you need to worry about and they weren’t there, so that was good. Vokes was forced to withdraw from the Wales squad that faced the Netherlands at the Cardiff City Stadium last month when suffering a groin strain in the 0-0 draw against Wolves at Molineux. The forward, who has scored three times this season, returned to Sean Dyche’s starting XI at the weekend having missed games against leaders Brighton and the Bluebirds. “I felt good,” he said. “It was good to get another 90 minutes under my belt and I felt really strong. “Hopefully I can kick on now with some more minutes and get stronger. “It’s been a bit frustrating really because I went down to Wales thinking I might be fit for that game and it ended up being a couple of weeks more. Vokes added: “It’s frustrating. I was building my confidence up and getting a lot of minutes. Vokes was denied his first goal in eight appearances for the Clarets by an outstanding save from Jordan Pickford in the first half. Having scored his last goal in the win against Rotherham United at the New York Stadium in October, he said: “It was a great save. I thought I hit it really well and he’s reacted well to it. Typically it falls down and hits the bar and goes over when Andre’s there to tap it in. Vokes added: “It was very disappointing and a frustrating afternoon. “I think we started really strong - probably the best first 20 minutes we’ve played this season.